Not many of us can garden in the fashion of impressionist Claude Monet. Lacking the 5-acre garden, help from a full-time gardener and (most importantly) artistic genius, we instead look at Monet’s paintings, and sigh. There was a lot of sighing, and gasping, and general oohing and aahing at the Minneapolis Institute of Art this morning during photographer Derek Fell’s talk on Monet’s garden. The event was part of the MIA’s annual Art in Bloom, and the auditorium was packed with enthusiastic gardeners and art lovers. In addition to photographing gardens, Fell designs them so he brings great knowledge and sympathy to his photographs of Monet’s garden. We’ve occasionally used his stock images in Northern Gardener. He recently completed a book on Monet called The Magic of Monet’s Garden: His Planting Plans and Color Harmonies. At the MIA, he talked about how Monet used color and lines to create the depth and luminescence in his art. Some of these are techniques we regular gardeners can employ. For instance, in order to create the shimmer that impressionists are known for, Monet used white flowers or silver plants. But white shouldn’t be used in a clump, Fell said. A clump makes a hole in the garden; dotted throughout the garden, white plays off the other colors and brightens them. As Fell said (and he may have been quoting Monet), you’ve got to sprinkle it like salt and pepper. Monet used color harmonies throughout his garden. His plantings would be all in cool colors (such as in the painting above) or in hot colors. Cool harmonies include blues and purples, hot ones reds, oranges and yellows. Monet sometimes would plant beds of hot colored flowers in front of beds of cool colored flowers. From a certain angle, the cool behind the hot makes the bed look deeper. Monet also used only straight beds because he wanted to create deep perspective and a sense of walking into infinity. His famous water garden took the opposite approach, according to Fell. That was a cup garden, where the visitor was called to introspection. Monet, like many smart gardeners, planted at least three of any of the water lilies he chose for his water gardens. Monet’s interest in gardening grew from his painting. He gardened to create the kind of place he wanted to paint. In the process, he created the kind of garden many gardeners would like to visit. 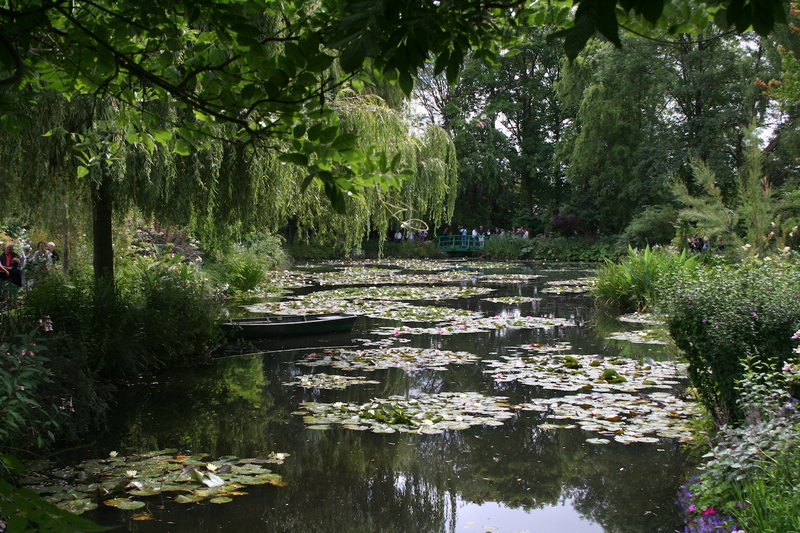 Monet’s famous water lilies attract thousand of visitors to his garden. This is an interesting look at colour theory for the garden. A look at a Monet painting does make you yearn for large swaths of colourful plantings. I try to create what I hope will be good combinations, but I don’t always time it right with the capricious or short bloom times of some perennials. Lately I’ve been settling for trying to get some good foliage combinations. However, while looking at the above painting, I’m getting the urge to tear out a little more lawn and widen a few beds.